It is expensive to make a game. It is even more expensive to make an MMO. Just ask companies like BioWare/EA who reportedly spent $500 million on Star Wars: The Old Republic. Because of that extra risk, many companies fail at making an MMO that turns a profit and many chose to call it quits before taking the chance, such as Blizzard who recently cancelled its "Titan" project after seven years of development. Sony Online Entertainment, the MMO development and support division of the Sony conglomerate, probably has more experience shipping quality and, more importantly, profitable massively multiplayer online games than any other company out there. That's because SOE has changed along with the market, such as adopting the free to play model ahead of its competitors. With its flagship brand EverQuest, Creative Director Dave Georgeson said the company is taking full advantage of new concepts in gaming such as open world crafting and early access for devoted fans. These experiments in EverQuest Landmark are changing the way SOE makes MMOs and funds their development. EverQuest Landmark is always going to be different and separate from the planned sequel of EverQuest Next, but the two are very much related. 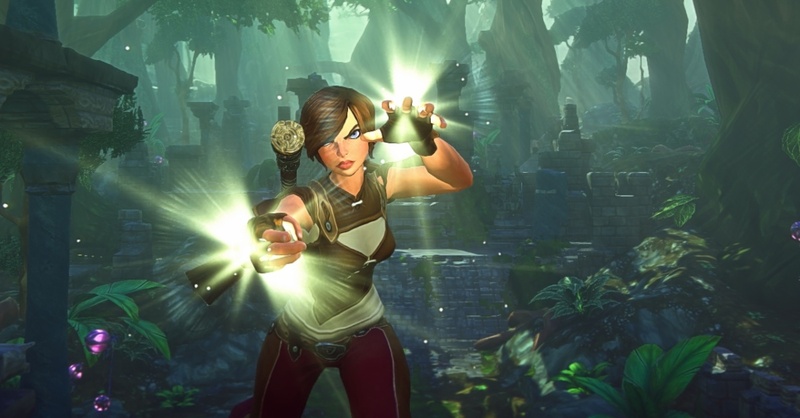 "We wanted to build EverQuest Next, and we realized that along the way we could let people play this very, very cool idea called Landmark," said Georgeson. "They can actually help us build what we needed to be able to go to EverQuest Next." While the development of the next big fantasy MMO progresses, Georgeson and his team opened up the alpha and beta of Landmark with very different intentions. "Landmark is fundamentally different," he said. "We give them a little thin wrapper of lore, so that they had something that they could cling to, but in general, it's whatever they want to build. They're going crazy in all kinds of different directions. They're not limited to heroic fantasy like we are in EverQuest Next. They can be doing science fiction and wild west and, you know, crazy platformer stuff so it becomes this potpourri of everyone's imaginations and cool ideas. Then the community is set up in such a way that that stuff rises to the surface and they can find each other really easily. "Landmark should become this thing that's unstoppable," said Georgeson. I haven't been able to spend as much time experimenting with Landmark as much as I'd like, but the buildings and sculptures the community has created using the crafting tools in the game are breathtaking. You've probably seen some pretty cool creations in Minecraft -- what's in Landmark puts all that to shame. If you plop down the cost for a Founder's Pack -- which is not insignificant - you can get in the game world, create a character, and claim a plot of land to start building once you collect enough resources. The tools to do so are robust and allow very fine details, and the team is always tweaking the user interface to allow players to work as easily as possible. But there's not really a game there. Not yet anyway, but it's coming slowly. Last month, the team added a whole bunch of systems such as player death, PVP, and rudimentary combat. "We have the health and damage, we have armor, health, and energy now," Georgeson explained. "Armor protects your health. When you start taking damage on it and then if you run away and don't take damage for a while it'll regenerate, and protect your health again. When you run out of armor then your health starts getting blown away. Energy is now used to power both your movement abilities such as grapple, double jump and all that other stuff as well as the offensive abilities that you get from your weapons."